When you run an operationally intense company, you know that operational excellence is key to success. Taking your company from 0 to 1 can therefore only be done by investing in your operations. This is why companies build operational admin panels that give structure to the responsibilities of their operational team members and allow them to deliver the best possible experience to their customers. However, your business, its product and services evolve at dazzling speed, which has repercussion on your operational tools. They quickly become limiting, frustrating, or even deprecated. In this short post, I would therefore like to outline the costs associated with running an operational admin panel, and, with this in mind, deep-dive into the most important qualities one should look for when selecting operational tools for a a growing company. Operational admin panels do not come free, nor do they come cheap. Building and maintaining them requires that you invest considerable amounts of resources that are not all easy to measure, quantify and assess. Implementation efforts: An important cost resides in the initial implementation and the ongoing efforts required by your current admin panel. Even after the initial implementation a lot of energy gets lost in the constant back and forth between the admin users, and the product and development teams. They are almost continuously making so-called “little modifications” to improve the user experience, taking time and energy away from structural improvements, your customer-facing product and other projects. Maintenance costs: Another cost you should consider is the sum of resources required to keep your admin panel up and running at all times. As your operational admin panel is key for your business teams, they need to be able to work on it at all times, for downtime brings with it large opportunity costs. Suboptimal productivity: A hidden opportunity cost often forgotten is when the productivity of your operational teams is lessened by small regressions and inefficiencies introduced into your current admin panels (see below) or, even more importantly, by important missing features that would otherwise unlock value for your business. 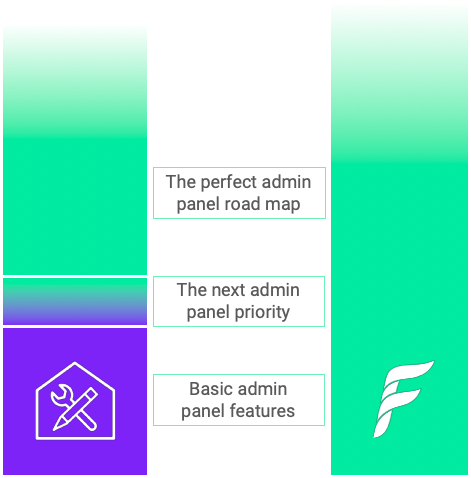 With the cost of building and maintaining your own admin panel in mind, we have developed the first-ever admin panel framework. Our stack-agnostic framework provides you with all the necessary building blocks to address your company’s specific use-cases, even in complex micro-service environments. Our admin panel takes little time to set-up for your teams and the initial usage is free. We also understand that you cannot just change the way you work overnight, nor should you! Paul Graham suggests that: “As a young company, you should do things that don’t scale.” Nevertheless, our take is that once you start growing, you should look into solutions that do scale. Forest Admin allows you to do just that and easily build an admin panel to test a use-case on a defined subset of your team. This takes only a fraction of the time it would otherwise and minimizes the experimentation and switching costs for your development team. We take care of all the heavy lifting and let you focus on increasing the competitive advantages that make your operations stand out. For larger projects, our solutions engineering team can provide you with advanced guidance to ensure that you unlock all the potential Forest Admin has to offer. Considering the costs outlined above, the question becomes what qualities should you look for in an operational admin tool to help you minimize these costs? Our understanding is that companies traditionally address these concerns by favoring tools that are both scalable and flexible. Scalability: To start with, a scalable admin panel tool is a tool that is best in class on all the basic features. This might sound low tech but it takes a lot of time and energy to build a tool that can reliably serve your operations in its simplest tasks (this is topic we touched upon in our second myth-busting article: “I’ll build my admin in one week!”). This isn’t to say you don’t also need advanced features. In fact, the basic functionalities alone will never set you apart from your competitors. You can only differentiate your operations by building innovative, and therefore more complex, features that drive real value for your business. In the end, this often requires that a company have a dedicated team working on nothing but their internal operational tools. Flexibility: Companies also ensure that operational flexibility is part of the DNA of their tools from the very start, so that they can to address all of their use cases without making any trade-offs, further down the road. To save yourself the endless back and forth between your developers and your operational team, the latter should be able to make changes to the interface of your admin, add team members, change workflows on their own. Scalable features: Forest Admin provides you off-the-shelf with all the basic admin panel features your current admin panel has, so you can focus on building the features that will help your operational teams drive real value for your business. To allow you to build those more advanced innovative solutions that will allow you to scale, we have developed a set of features called the Smart Features. With these features you can extend the admin API in any way that you see fit. Flexible empowerment: Thanks to the adaptability, interactivity and ease of use of our platform your operational teams will no longer be required to do constant back-and-forth with your development team. Intuitive team management, a drag-and-drop user interface, intelligent filtering and many other features empower your operational teams to instantaneously optimize the tools they use every day themselves. You can learn more about the flexibility of the implementation of the framework in different industries on our customer’s page. Almost as important as Scalability and Flexibility are Reliability and Security. These are also key qualities of an operational admin tool. You can read in more detail about how we help our clients with these priorities, in our fourth myth-busting article “I would never externalize my admin panels development”. Even though you might already have an operational admin panel in place that covers your bases, you should make a correct assessment of the costs that come with it. With an admin panel framework, like Forest Admin, you stand to gain time for your developers, improve scalability in terms of features, and unlock flexibility toward the operational teams. In case you want to test out the power of the Forest Admin panel framework you can get started in no time using this link.